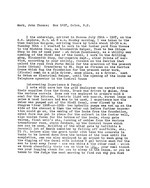 Mark, John Thomas; Box 1497, Colon, R.P. then Section Qorgona, arriving there by train about 10:30 a.m.
Marshall lot of death meantime by falling off scaffolds, etc. Pablo, their was a large iron bridge to cross, with said R.R. lived, & a Catholic church bell ring from outside in the yard. Gatun, as the first telephone operation.